One of the main benefits of CRM software is the ability to get every aspect of your business working in sync. By uniting your communication and marketing tools with your sales platform, your team can conduct and track all their sales conversations from a single tool. But if you also rely on accounting software to manage incoming and outgoing payments, there are a lot of hidden benefits to integrating it with your CRM as well. QuickBooks is an accounting software platform geared towards small and medium-sized businesses, offering millions of businesses a simple way to manage their daily sales and expenses, invoice their customers, accept payments, pay their bills, and generate reports for planning and tax filing. Nearly every major CRM on the market offers a QuickBooks integration, but these integrations are far from equal. Some CRMs offer a one-click setup, while others require a longer, more complicated installation. Considering that many CRM users say their #1 challenge is finding a platform that integrates well with QuickBooks, it’s important to choose wisely. Let’s take a look at why you need to get your CRM talking to your accounting software, and some of the best CRMs that integrate with QuickBooks and QuickBooks Online. Small businesses often use QuickBooks as their first CRM, since it stores customer contacts and buying histories. When your business is just getting started, being able to access customer contact information from your accounting software might be enough. But just like spreadsheets, QuickBooks doesn’t actually do anything to help you make sales—it only helps you manage billing and accounting after the fact—so it’s important to connect your QuickBooks account with software that helps you manage your pipeline. Think of integrating QuickBooks with your CRM as a way for every member of your team to have a birds-eye view of every client. What stage of the buying process are they at? Do you need to nurture them more? What do their past buying behaviors look like? What did you discuss during your last conversation with them? 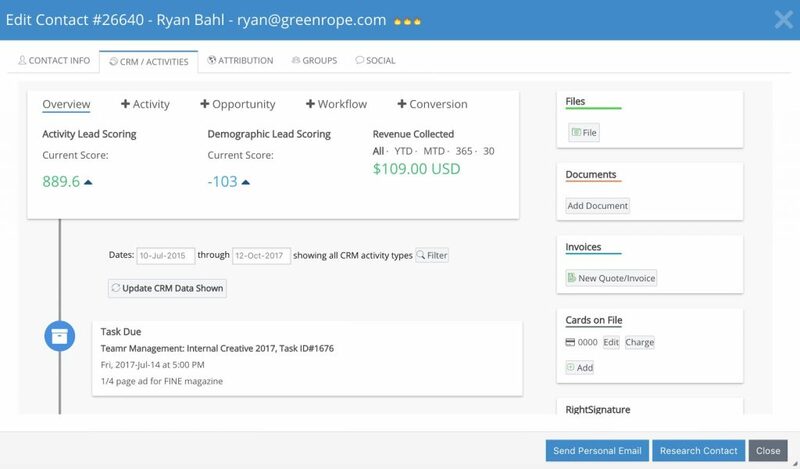 Sure, automating your invoicing, billing, and follow-up on unpaid invoices saves you valuable time, but the real magic of uniting your QuickBooks account and CRM platform is that it provides transparency to your entire sales funnel, which boosts your chances of closing more leads and growing your business. And since your accounting software needs to be a reliable source of truth for billing and payment information, keeping your CRM and accounting software synced will keep your customer data clean and organized for the whole team. The realization of how many leads you have sitting in your pipeline probably won’t hit you until you import all your data from QuickBooks. What does your QuickBooks customer list look like right now? Is it jam-packed with customers who you’ve spent time and effort crafting proposals or estimates for…and never heard back from? If so, ask yourself: How many of those leads has your team followed up with, to the best of their ability? Those cold leads don’t belong in QuickBooks. They belong in the hands of your sales team. All of a sudden, that boring accounting data is a lot more interesting. This is particularly convenient because when you’re evaluating CRMs for your sales team, you don’t have to be limited to the handful of platforms that offer a native QuickBooks integration. At the end of the day, you want to pick the CRM that fits your business the best, not the CRM that fits QuickBooks the best. Having a Zapier integration doesn’t mean the integration will be limited in terms of functionality, either. Several of the CRMs on our list can do just as much with their Zapier QuickBooks integrations as those with purpose-built integrations. 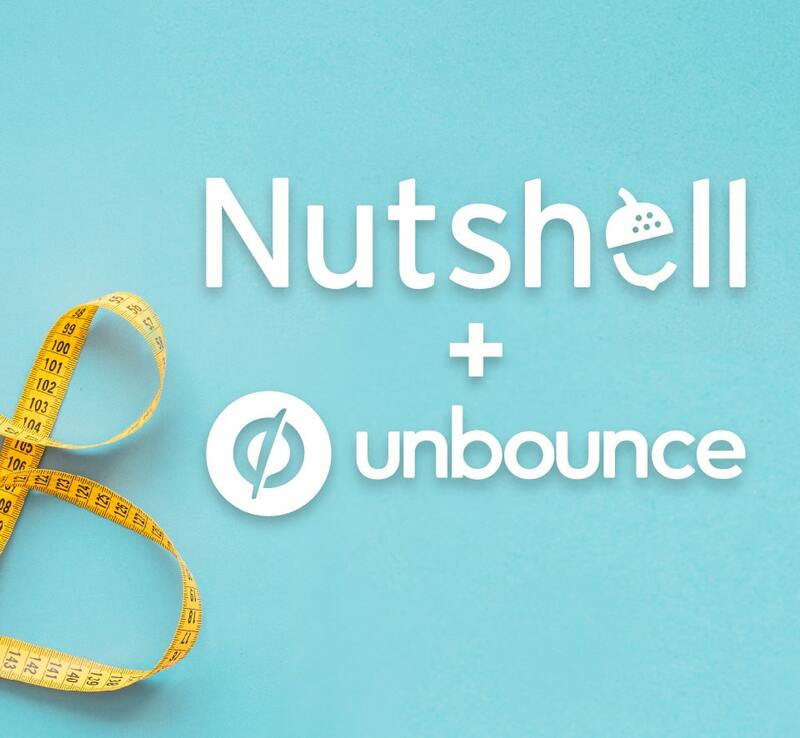 Nutshell is a sneaky powerful CRM and sales automation platform that’s designed to help sales teams do things quickly, and their QuickBooks Online integration is a great mix of sophisticated and simple. If you have a customer list stored in QuickBooks Online, you can import it into Nutshell in just a few clicks with their native direct importer. All of your QuickBooks Online customers will be rolled over into your CRM in seconds, so you can start tracking communication histories, nurturing clients towards repeat business, and incorporating your QuickBooks contacts and data into your sales and revenue reporting. Nutshell also offers a Zapier integration with QuickBooks Online, which allows you to trigger invoices, bills, or new records through QuickBooks once you’ve enabled the connection through Nutshell, and keeps customer records synced in both places. Best for: Sales teams looking for a full-featured CRM that’s user-friendly and highly customizable, with the bonus of having an easy way to integrate with QuickBooks Online. Method is one of the CRMs on our list that plays well with every QuickBooks product. Whether or not you use QuickBooks Online, Pro, Premier, or Enterprise, your data will integrate seamlessly with Method. Because of its broad integration capabilities, it’s a good choice if you’re looking for a CRM where QuickBooks is absolutely integral to your sales process. From creating estimates to invoicing, Method makes it simple to perform common QuickBooks tasks from within their system. Method also syncs contacts across both platforms to save you loads of time on data entry. However, for what it offers in QuickBooks features, Method lacks in some other important aspects of a sturdy CRM, like pipeline automation, customizable reporting, and built-in phone capabilities. Best for: Companies whose #1 priority in a CRM is how well it plays with QuickBooks. Insightly prides itself on its QuickBooks integration. Like Nutshell, Insightly’s main focus is around its QuickBooks Online integration, and they’ve done it well. Insightly’s integration is simple to use, easy to install, and offers you a lot right out of the box. You can view the payment history and status on any of your customers in a customized “QuickBooks Online” tab. Like other CRMs, Insightly will give you a complete history of any customer you have on your books, allowing your sales team to have a better understanding of the customer they’re dealing with. 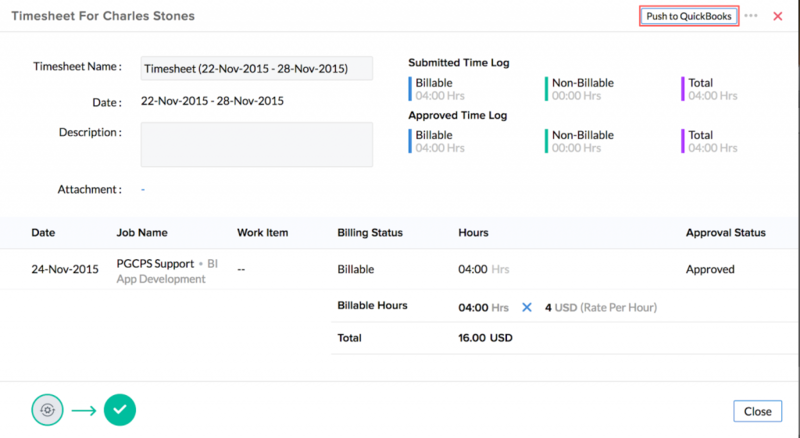 Because it plays so nicely with QuickBooks, you might find it surprising that you can’t create invoices or estimates directly from Insightly. 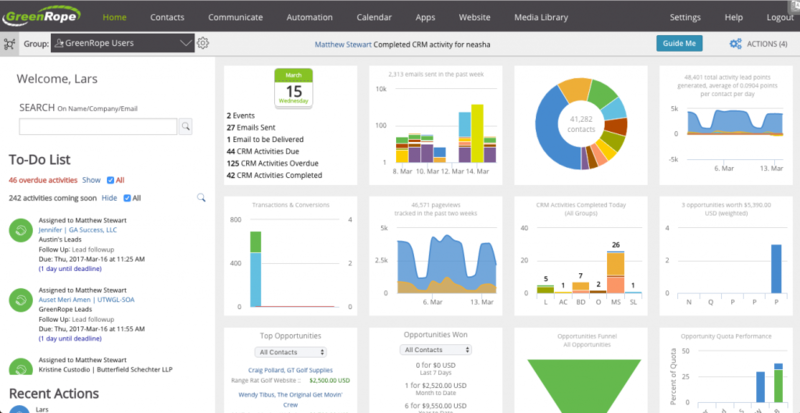 Despite all the bells and whistles, you have to leave your CRM to bill a customer. You also can’t accept direct payments through the CRM either, so if these features are deal-breakers for you, you might have to look for another CRM. Best for: Businesses that need advanced project management features in their CRM platform. Zoho’s integration with QuickBooks leans heavily on customization. It’ll take you a while to set it up, though. Although Zoho allows you to add QuickBooks easily enough from the integration dashboard, that’s about as simple as it gets. The upside to all this complexity? Once you set up QuickBooks in Zoho, the level of control you get back is great. Best for: Companies who need a customized, advanced QuickBooks/CRM relationship. Salesforce once had a special integration with QuickBooks called Salesforce for QuickBooks. The program allowed the sales CRM to plug straight into QuickBooks. But there were problems, and the software was scrapped after three years. The integration was really only set up for businesses at the lower level of Salesforce, and it turns out the program wasn’t compatible with a lot of Salesforce’s own extensions. Thankfully, Salesforce also plays nice with Zapier. So if you’re looking for a QuickBooks integration through Salesforce, you can still have it. 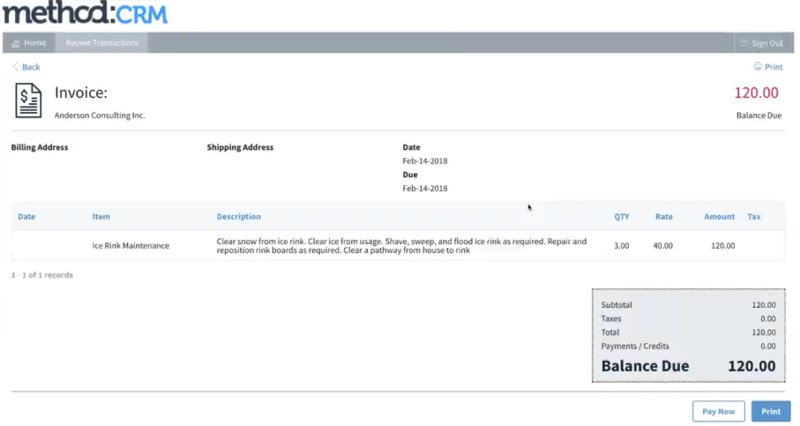 Once connected, you’ll be able to sync your QuickBooks customers to Salesforce accounts and view all of their details from the CRM interface. You can also do loads of other stuff with the integration, like create transactions, invoices, and manage accounts. A complete sales history will also be available to your team right from Salesforce, along with an automatic data sync between both platforms. Best for: Large companies who are looking to work from the Salesforce Sales Cloud. At the moment, the only way to connect QuickBooks to Copper is through Zapier. You’ll need a premium QuickBooks and Zapier accounts to connect the two. Once you connect through Zapier, you’ll be able to log payments as activities. 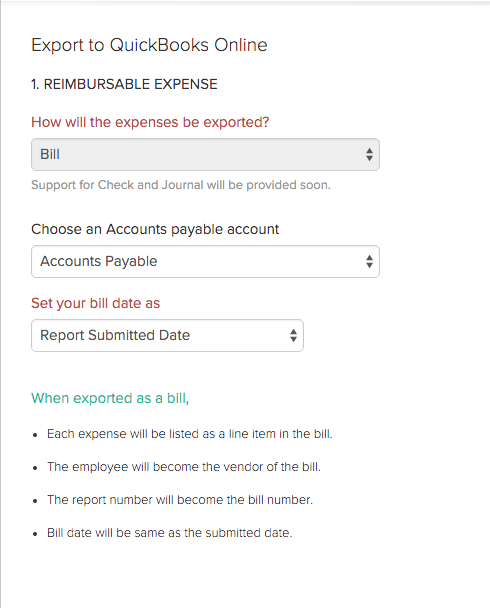 You’ll also be able to view past invoices and payment amounts on your records, straight from the Copper dashboard. Copper’s integration with QuickBooks is fairly limited. There are only a couple of functions available through Zapier to make Copper and QuickBooks talk. But if you only need a lightweight QuickBooks integration, and you are looking at Copper because of its integration with G Suite, don’t be entirely put off. 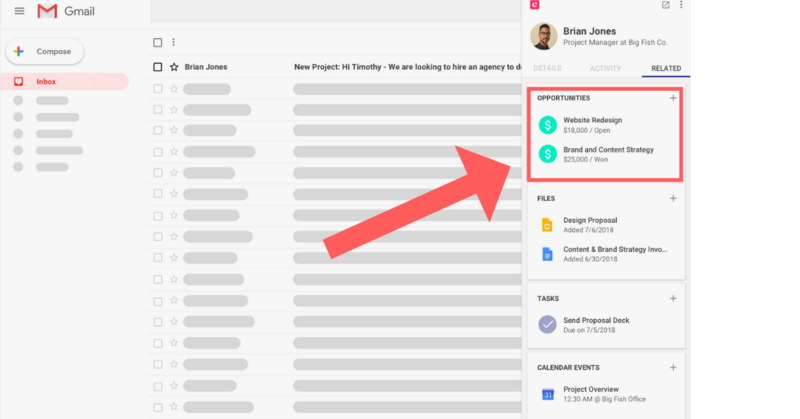 Best for: Companies who have sales teams that work primarily out of G Suite. 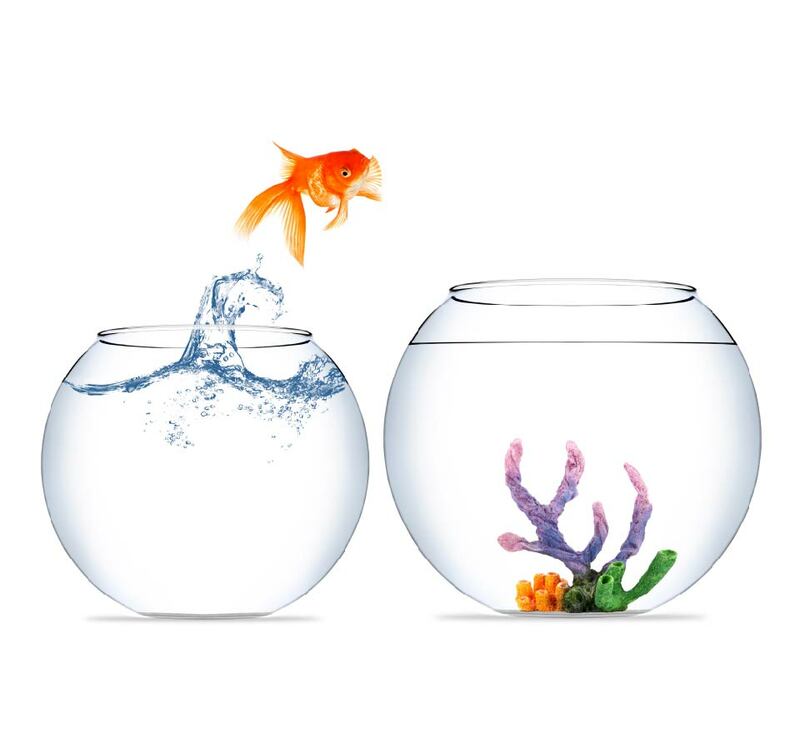 Freshsales is another CRM that puts its QuickBooks integration at the forefront of its sales pitch. And rightly so. 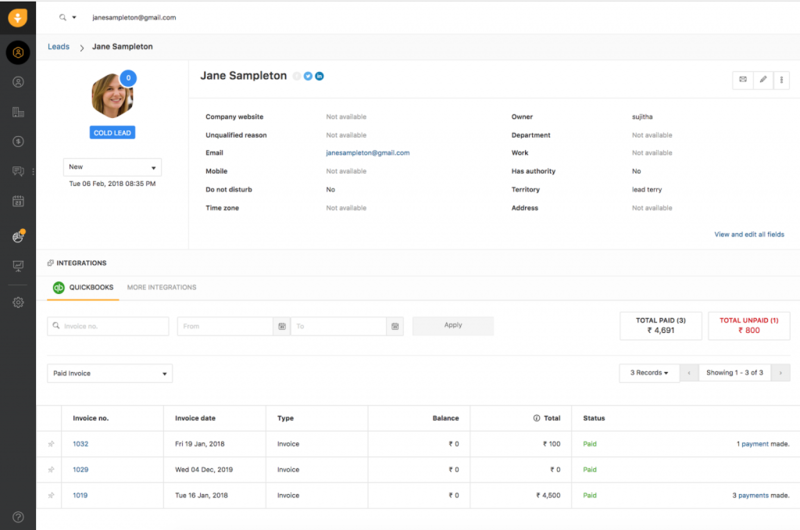 Freshsales lets you pin or connect invoices to contacts from the CRM, which can come in very handy if you are having trouble chasing payments. The integration allows invoices and customer histories to be kept for each customer on the Freshsales interface. But it’s the built-in phone feature that makes this integration unique. If you’ve got problems with invoices or payments, your finance team will be able to follow up with them easier—all from Freshsales. The feature will also be a massive bonus if your sales team closes more deals over the phone. Because of its functionality, Freshsales gives your sales reps the tools to control the entire deal, from prospecting to the final invoice. But, there is some bad news. Although it offers a lot, you still can’t invoice a customer directly from Freshsales, or make payments. Best for: Sales teams who close a lot of deals over the phone. Even the smaller CRMs on our list are getting in the QuickBooks action. Although GreenRope only has about 3,000 customers worldwide, they offer direct integration from QuickBooks into their software. Some of the features you’ll get from the integration include importing customers as new contacts and transferring your invoices across platforms. You can also sync your customer data over from QuickBooks and then set the system to update any data from that point, automatically. GreenRope currently uses QuickBooks’ own Intuit Web Connector, which can be easily installed onto your desktop. You need this to be running for the syncing of invoices and contacts within the CRM, though. Best for: Businesses who are looking for a one-stop, no-frills CRM. Having a QuickBooks integration in your CRM is important. Very important. That’s why most CRMs on the market have stepped up to the plate and offered some way to integrate QuickBooks into their system. But while it’s important to integrate QuickBooks with your CRM, it doesn’t have to be your main priority when choosing a CRM. Remember: Choosing the right CRM for your business can make a massive difference to the performance of your sales team—not to mention your customer service team, your marketing team, and how all these teams work together. So ask yourself, are you looking for a CRM that fits QuickBooks, or a CRM that fits your business? Look at the bigger picture, and choose a CRM that will help your entire business, not just a part of it.